Northport NY – On March 24, 2017 M.C. 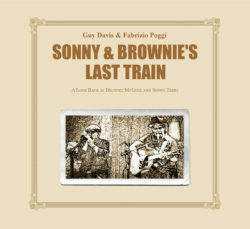 Records will proudly release Sonny & Brownie’s Last Train by the Ambassador of the Blues, Guy Davis and international harmonica sensation Fabrizio Poggi. The deep, acoustic blues sessions took place in Milan Italy and were recorded live in the studio. The result captured the special musical connection that Guy and Fabrizio possess from the years of playing and recording together.